Why should someone buy the Steinsaltz Talmud over ArtScroll’s immensely popular Shas? Rabbi Steinsaltz: Look, it’s not the same. I would put it in the following way: When you learn from my Gemara, I hope that you get a kick to learn further, and that you don’t feel that you know everything and that all the problems are answered. Does the ArtScroll Shas not do that as well? I think ArtScroll gives too much in a way. Everything is in there. I’m trying to have it in a way that you study and want more. Basically I want, not just that you will look at the Gemara, but that you will get involved in it. You cannot learn Gemara completely passively. You have to be a participant. There are two parts to what Hillel HaZaken said about kol haTorah kulah. One part is always quoted – “What you don’t want done to you, don’t do to others.” But the other part – “And all the rest go and learn” – is no less important. In the original editions of the Steinsaltz Talmud, you changed the traditional look – the tzuras hadaf – of the pages, for which you were heavily criticized. For the new edition of the Hebrew and English Steinsaltz Talmud, however, you restored the old look. Why did you originally change it and why did you restore it? Look, in the beginning, it just couldn’t be done. All the additional material couldn’t be put on the old pages. I tried twenty-odd formats, and found out that if I used the traditional page, it would be at least two and a half times as big, which wouldn’t be usable. So the question is: What do you do – duplicate the page as ArtScroll did or cut it? What I originally did in my Hebrew Gemaras was cut it. About 150 years ago in Poland, an edition with exactly the same kind of half pages was published. They made notes about why this was needed and [said] there was nothing holy about the other format. The traditional page is after all just a page. Even sifrei Torah can be written in different ways; surely Gemaras can be done differently too. Why, then, did you restore the traditional page and move your commentary to the back of the book in the new editions of your Gemara? For some people it has sentimental value. There are all kinds of people who are sentimental, and sometimes you give the people who are sentimental their sentiments. The new Gemaras have the name “Rabbi Adin Even-Israel Steinsaltz” on the front cover. 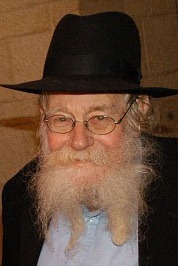 Most people know you as “Rabbi Steinsaltz.” Where did “Even-Israel” come from? It’s a long story, but it’s connected with the Lubavitcher Rebbe. He wanted me to change my name for some time. He didn’t give me any explanation. And he picked the name “Even-Israel”? [We picked it] together in a way. …I don’t want to go into the details. Some of it was not nice, but not on my side. On my side, I tried to do one thing, and that was to keep quiet. I could have said lots of things, but I tried to keep quiet because I didn’t want to besmirch anybody and it wouldn’t have done any good. Basically, people don’t really have any questions, except that they may not like my face. Otherwise, when it comes to any real point, there’s nothing in it. What about the argument that you portrayed the avos and imahos as human beings with human faults? Look, take Rashi or the Ibn Ezra or the Ramban or any of the commentators – all of them do the same thing. It’s just pure nonsense what you are saying. I depicted the avos and imahos as they are found in every Jewish source. I just put them together, and all the rest is just a combination of am ha’aratzos and some dislike. Getting back to contemporary times: In 2004, a group of Israeli rabbanim attempted to revive the ancient semicha ritual and reestablish the Sanhedrin. At the time, you accepted the position of nasi of the Sanhedrin. You resigned, however, in 2008. Why did you join and why did you resign? I thought it could be a good beginning for something, but it didn’t work out. What do you mean by “work out”? Working out means more and more people get involved. If it doesn’t get more people – and more important people – involved, it means it didn’t somehow cut through the right place. And whatever you do, if it doesn’t work, so it doesn’t work. So you would suggest that the rabbis still involved in this project let it die? We are going to publish a new edition of Mishnayos. We are also working on an edition of the Rambam with a commentary by me and others that makes a better connection between the Rambam and the Shulchan Aruch. And I’m also doing a project about the commentary on the Bible, and other things as well.